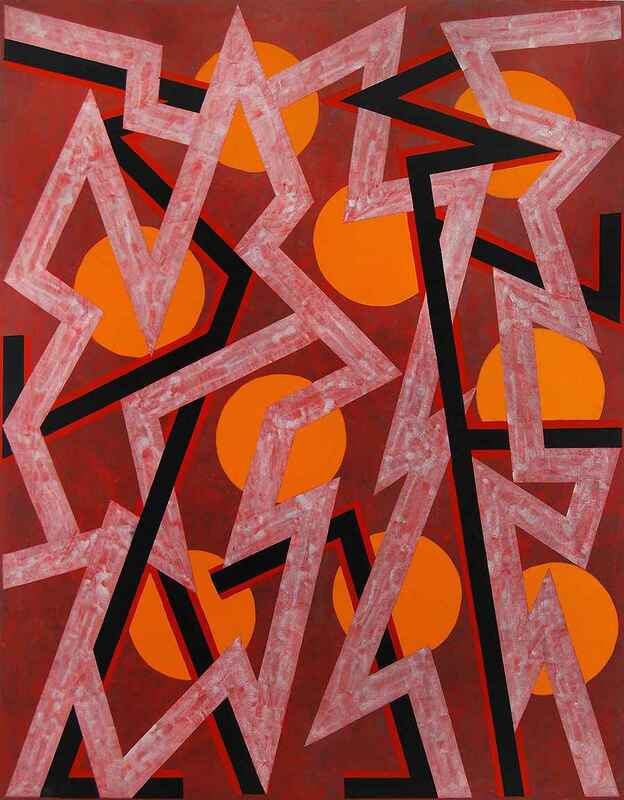 A leader in the hard-edged, geometric abstractionist movement that arose in the U.S. and Europe in the late 1950s, Edwin Mieczkowski is regarded as one of the earliest proponents of Optical Art, a style that rivaled Abstract Expressionism for dominance in the mid-1960s. Born in Pittsburgh in 1929, he received his BFA from the Cleveland Institute of Art in 1957 and his MFA from Carnegie Mellon in 1959. He taught at the Cleveland Institute of Art for 39 years, even while maintaining a home and studio for a number of years in New York City. Together with Frank Hewitt and Ernst Benkert, he formed an artist group called Anonima. Sharing studio space in New York and other locations, they followed a rigorous, self-imposed program of painting exercises to explore the effects of color, brightness and form on visual perception, prefiguring and becoming part of the Op Art movement. Mieczkowski’s painting, Adele’s Class Ring, appeared in the 1964 Time magazine article that first introduced the term Op Art to the public. With his Anonima colleagues, he was also included in The Responsive Eye exhibition at the Museum of Modern Art in New York in 1965—the seminal exhibition of Optical Art—alongside work by such artists as Josef Albers, Victor Vasarely, Julian Stanzcak, Morris Louis, Kenneth Noland, Richard Anuszkiewicz, Carlos Cruz-Diaz, Ad Reinhardt, Jesús Rafael Soto and Bridget Riley. Mieczkowski’s work was a part of Optic Nerve: Perceptual Art of the 1960s, the major exhibition at the Columbus Museum of Art in 2007 that presented a major reconsideration of Op Art. Mieczkowski spent several decades of his professional artistic career quietly pursuing his intuitive explorations in geometric and perceptual abstraction while teaching at the Cleveland Institute of Art. He executed a number of public art commissions in this period, the most prominent being his 1979 tondo titled Sommer’s Sun in the Cleveland Public Library’s Brett Hall. His work has been collected by museums in Israel, Denmark and Poland as well as the Cleveland Museum of Art, the Akron Art Museum, the New Jersey State Museum and the Robert Hull Fleming Museum in Vermont. Mieczkowski's most recent work uses the straight lines, curves and angles of geometric abstraction to create dazzling representations of concepts from the new sciences, especially biomedicine and biotechnology. In 2013, Mieczkowski’s archives were given to the Smithsonian Institution in Washington, D.C.